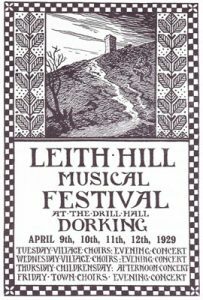 The Leith Hill Musical Festival is more than 100 years old and today there are still many people in and around Dorking who remember those extraordinary occasions when Vaughan Williams was its conductor. Reproduced below is an article from a newsletter produced by one of the choirs which participated in those legendary concerts — Capel Choral Society. Ralph Vaughan Williams became conductor of the Leith Hill Musical Festival in 1905 for the first concert, and continued in this capacity until 1953, so there are still many people in and around Dorking who have sung under his baton. He is remembered as having a wonderful gift for getting the very best out of singers and players, and possessed that ability to fly into a towering rage when the choir displeased him in some way, and then immediately temper it by telling a pertinent funny story. 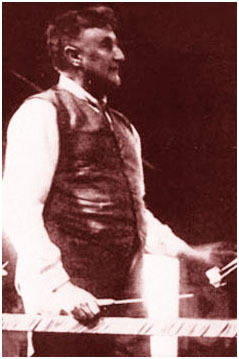 He was even known to throw down his baton in the middle of a concert (resulting in instant silence), saying “Ladies and gentlemen, we can do better than this!” On other occasions he carried his insistence on perfection to extremes. For example, when he was awarded the OM in 1935, a party was laid on for him at Abinger Hall. As he arrived, a garland was hung round his neck and a choir sang a madrigal. He waited patiently for the music to finish, removed the garland and his jacket saying “Now let’s sing that properly”, and took the choir through the piece again. RVW of course wrote much of his music with the Festival in mind. In 1930, to celebrate its 21st anniversary, he composed a piece for each Division. From 1929, he became completely immersed in the life of Dorking when he moved from Chelsea due to Adeline’s ill-health. In 1933 he bought a house called ‘White Gates’, on the lower slopes of Ranmore Common (it was demolished in the 1960’s). It was a rather strange house which had a huge central room which could take a choir of 50 with ease, making it very useful for rehearsals. It also had an almost circular bay of twelve windows on the southwest corner. This RVW used as his study and worked on his compositions here. In 1929 Vaughan Williams joined the Leith Hill District Preservation Society, later to become its Chairman, then its President. The Society was founded to help preserve areas of natural beauty around Dorking and was instrumental in preventing the building of a new town just south of Dorking. Crawley later suffered this fate instead. RVW became well known in Dorking – his large shambling figure, usually untidily dressed was often seen as he did his shopping. One shopkeeper remembers him asking for a parcel of goods to be wrapped and addressed to him as he was inclined to leave his shopping in ‘odd places’ and forget all about it! Also on the subject of shopping, a friend tells of the time when she was leaving a bakers’ with a large bag of bread rolls – the bag promptly burst and the rolls went everywhere. Dr Vaughan Williams was passing and insisted on going down on his hands and knees to help collect the rolls! 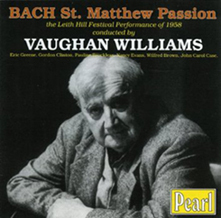 The work for which RVW is chiefly remembered in Dorking is probably not one of his own compositions, but the Bach St Matthew Passion. This was first performed in the town by the combined Festival choirs in 1931 at the opening of Dorking Halls. It was a moving occasion, as the composer’s sister Margaret, the Festival’s founding Secretary had died earlier that year and the performance was dedicated to her memory. “You will understand that while I am not being unduly modest when I say there will be some applause when I come in, it is not fair to ask the audience to do this twice, so I shall appear in one half of the programme only”! After he retired as Conductor he still took an active interest in the rehearsals and concerts. On one occasion he came to a rehearsal of the Sea Symphony being conducted by Dr William Cole. He sat down amongst the basses, saying to the bass next to him, “I’d better sit next to you as I don’t know this myself”! With his involvement with the life of Dorking, one wonders how VW ever found time to write music. In fact he wrote a large number of works, including three symphonies while he lived in the town. The 4th, written in 1935 is almost a foretaste of the coming of war and full of turmoil, while the 5th, written during the war is a very peaceful work, perhaps a reaction to the destruction taking place. The 6th, written between 1944 and 1947 seems to recall the years of conflict. RVW insisted that it was not a ‘War’ symphony (“Don’t they understand a man might just want to write a piece of music?”), but it is certainly full of the turmoil which characterised the 4th, and the use of saxophones in the scherzo is perhaps an echo of wartime ‘big-band’ music. The Serenade to Music was also written in Dorking, in 1938. During WWII RVW’s patriotism led him to throw himself into anything he felt would help the war effort. When there were collections of aluminium pots and pans (‘for melting down to make Spitfires’ it is said), he undertook to push a hand cart around the town collecting from houses. He is remembered as wearing an old patched raincoat on these occasions and more than one resident almost refused to open the door to him, thinking he was a tramp! He also responded enthusiastically to the ‘Dig for Victory’ campaign. He dug over a 3/4 acre field next to White Gates and planted vegetables there – he was also seen following the milkman’s horse with a bucket and shovel! Early in the war he also helped fill sandbags for a barricade across the main road as an obstacle to possible invasion. He was in his late 60’s by this time, and still he composed music, including music for films such as the 49th Parallel and Coastal Command. This culminated in his music for Scott of the Antarctic in 1948. Vaughan Williams left Dorking in 1951 after his second marriage, to Ursula Wood, and handed the Festival conductorship to William Cole in 1953, but he still took a very active interest in all the individual choirs. He would make a point of visiting many of the local choirs during their rehearsals and often conducted the choir himself. On one of these occasions one of the basses confided to his own conductor with a rather misguided sense of loyalty “Dr Ralph took it rather faster than you do, but I sang it at your tempo all the way through”! At his new London home he composed many works, including his last three symphonies, bringing his musical output in this form to the ‘standard’ nine works. The 7th was entitled Symphonia Antarctica and based on the film score for ‘Scott of the Antarctic’. The 8th appeared in 1955, followed by the 9th two years later. Sir Adrian Boult conducted the first recording of this work. He says “It was planned for the 26th of August 1958. I was going down to breakfast that morning when the telephone rang. It was Ursula – ‘I’m sorry’, she said ‘we’re not coming to the recording; Ralph died at 3 o’clock this morning”.